These gift and online shops sell The Poppy Umbrella. They trade for registered charities of ex-Service and welfare organizations, for military and heritage museums, for educational associations and not-for-profit organizations. It is advisable to check that the style of Poppy Umbrella you would like to purchase is available before you make a special journey. Some offer online sales for purchase by mail order. English Heritage, Registered Charity No. 1140351, is the custodian of over 400 places which include war memorials and sites of historic relevance to the two World Wars. The Cenotaph in London is, perhaps, the most well-known war memorial in the care of English Heritage. 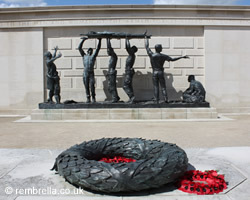 The National Memorial Arboretum is part of The Royal British Legion family. 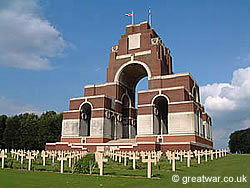 It is the United Kingdom's centre of Remembrance. 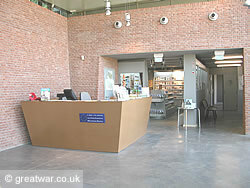 The National Memorial Arboretum is run by staff and volunteers. The National Arboretum Company Limited is a Registered Charity No. 1043992. 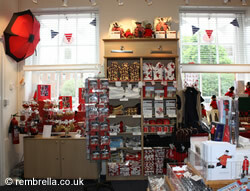 The on-site gift shop sells a range of cards and gifts including The Poppy Umbrella. All proceeds from sales in the gift shop support the National Memorial Arboretum charity. The shop is open daily 09.00 - 17.00 hrs. Closed Christmas Day. Buying from the Royal British Legion “Poppy Shop” helps to fund the work of The Royal British Legion (Registered Charity No. 219279). The Poppy Shop is operated by The Royal British Legion Trading Ltd. All profits from sales go directly to the work carried out by the Royal British Legion in its welfare support for the Armed Forces. The Poppy Shop sells a wide variety of poppy gift products, ceremonial items, cards and stationery. The Royal Hospital Chelsea Appeal Ltd. is a Registered Charity No. 1076414. All proceeds from funds raised by sales from the museum shop go to the welfare work carried out by The Royal Hospital Chelsea Appeal Ltd. for the ex-Service in-pensioners accommodated at the Royal Hospital Chelsea. The Poppy Umbrella was launched on the Royal Hospital Chelsea stand at the 1998 Chelsea Flower Show and proceeds from sales were passed to The Royal Hospital. The Poppy Umbrella continues to be a popular gift item at the Royal Hospital stand during the annual Chelsea Flower Show. The Union Jack Club is a private club for all serving and ex-service personnel below Commissioned rank of Her Majesty's Armed Forces. The Union Jack Club is a registered charity Rregistration No. 208731). It is also a company limited by guarantee, registered in England number 80683. The Rifles (Berkshire and Wiltshire) Museum is owned by the The Rifles Wardrobe and Museum Trust, Registered Charity No 272051. The museum and its shop are located in the famous Close of Salisbury Cathedral. For opening hours or to check availability of stock (telescopic style only) contact the museum via the details below. The Poppy Umbrella is available to members and non-members of FFFAIF. All proceeds raised by FFFAIF go towards research, projects and ceremonial attendances carried out by FFFAIF in the commemoration of the part played by Australian Servicemen and women in the First World War. The idea for The Poppy Umbrella was conceived as Lt Col (Retired) Graham Parker, OBE marched in a parade past the famous Cloth Hall in Ypres on a wet Armistice Day in 1995. 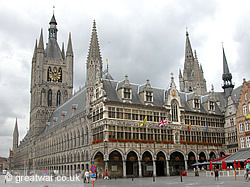 The award-winning In Flanders Fields museum and Visitor Centre are popular destinations for visitors to Ypres-Ieper. 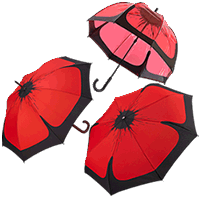 The Poppy Umbrella is one of a range of poppy-related items available from the shop. Proceeds from sales in the shop help towards funding the work of the town's excellent museums and archives. 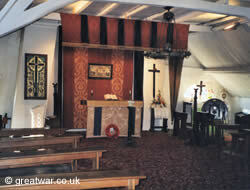 Talbot House (Toc H) is a "living" museum in Poperinge, used by British soldiers from December 1915 until the end of the war as a place for relaxation and rest behind the lines. The Poppy Umbrella is sold in the gift shop, proceeds from which help to support the work of the museum. All proceeds on purchases from the Legion Poppy Store support the work of the Royal Canadian Legion and Canada's Veterans. The Poppy Store sells a variety of high quality poppy gift products and commemorative items. The internationally renowned First World War museum has a well-stocked shop with books, maps, cards and many items associated with visits to the Western Front and the study of the war of 1914-1918. The Poppy Umbrella is available at the museum shop. The Thiepval Visitor Centre has a well-stocked shop with a wide range of quality books, cards, maps and items associated with visiting and studying the First World War battlefields. Some items are available for online mail order (not umbrellas). 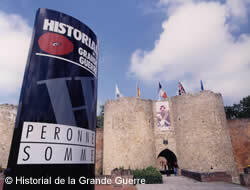 The Thiepval Visitor Centre is managed by the Historial de la Grande Guerre museum on behalf of the Conseil Général de la Somme. Juno Beach Visitor Centre is a WW2 museum and cultural centre situated on the Normandy beaches, scene of the Canadian landings on D-Day, 6 June 1944. The beach landing site is a national historic site for Canada. 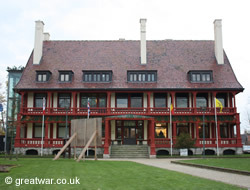 The Juno Beach Centre is a non-profit organization and is the only Canadian museum in Normandy. The Centre focuses on the involvement of Canadian military personnel and civilians in the Second World War on the battlefields and on the home front. Museum located in the building that was the operational and medical British Headquarters during the Battle of Arnhem in September 1944.